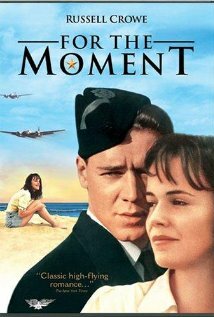 For the Moment is a 1993 film written and directed by Aaron Kim Johnston and starring Russell Crowe and Christianne Hirt. The plot revolves around airmen training in rural Manitoba, Canada, with the British Commonwealth Air Training Plan. The main focus of the story is the wartime romance between Russell Crowe’s character and a local girl. Johnson was inspired to write the screenplay based on the stories of his father who was an instructor and bomber pilot in the war, and his mother’s experiences as a young woman on the home front. With principal photography taking place over August–September 1992, one of the first jobs for the production was to scout possible locations. The film was shot at former Royal Canadian Air Force stations in Manitoba used during the War, including Brandon Airport and Rivers itself. Although there isn’t much flying in the movie, it gives a good sense of the locations. It’s possible to watch clips and match them against images from the bases. The brightly painted barracks at Rivers still feature on the town’s website. It probably falls under the category of a ‘romance’ more than anything else, but the beautiful scenery and the yellow Harvards and Ansons offer an emotive glimpse into Earle’s world. This entry was posted on Monday, November 14th, 2011 at 12:25 pm	and tagged with Brandon Airport, British Commonwealth Air Training Plan, Royal Canadian Air Force, World War II and posted in E.L. Britton. You can follow any responses to this entry through the RSS 2.0 feed.